Control over spatial distribution of individual neurons and the pattern of neural network provides an important tool for studying information processing pathways during neural network formation. Moreover, the knowledge of the direction of synaptic connections between cells in each neural network can provide detailed information on the relationship between the forward and feedback signaling. 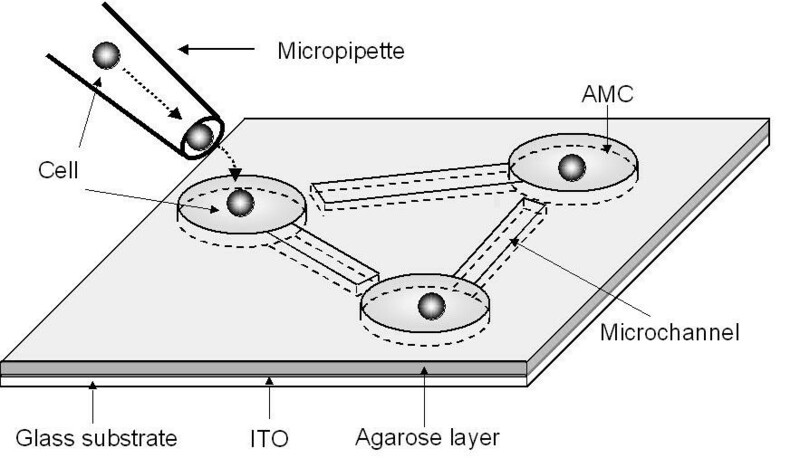 We have developed a method for topographical control of the direction of synaptic connections within a living neuronal network using a new type of individual-cell-based on-chip cell-cultivation system with an agarose microchamber array (AMCA). The advantages of this system include the possibility to control positions and number of cultured cells as well as flexible control of the direction of elongation of axons through stepwise melting of narrow grooves. Such micrometer-order microchannels are obtained by photo-thermal etching of agarose where a portion of the gel is melted with a 1064-nm infrared laser beam. Using this system, we created neural network from individual Rat hippocampal cells. We were able to control elongation of individual axons during cultivation (from cells contained within the AMCA) by non-destructive stepwise photo-thermal etching. We have demonstrated the potential of our on-chip AMCA cell cultivation system for the controlled development of individual cell-based neural networks. Acquisition of the epigenetic information is becoming more and more important for understanding the adaptation mechanism of living systems. One of the main interests of epigenetic studies in neuroscience is how such information is processed and recorded as plasticity within a network pattern, what might be caused by the change in the network pattern or by the degree of complexity related to the network size. One of the best approaches to understanding the meaning of the network pattern and size is to analyze the function of an artificially constructed neural cell network under fully controlled conditions. For many years the formation of neural networks (grown from individual neurons) and the firing patterns of neurons were investigated using microprinting techniques and the fabrication of cultivation substrates [1–3], patterning on silicon-oxide substrates  and three-dimensional structures made using photolithography . Conventional microfabrication techniques provide structures with fine spatial resolution, but are not very effective in studying epigenetic information. Making flexible microstructures with simple steps or changing their shape during cultivation is nearly impossible with conventional techniques since the shape is usually unpredictable and only defined during cultivation. We have developed a new on-chip cultivation system capable of cultivating cells in a controlled environment using agarose microstructures and a photo-thermal etching method [6, 7]. We can produce microstructures within the agarose layer on the chip using photo-thermal etching i.e. by melting a portion of the agarose layer at the spot of a focused infrared laser beam. This method can be applied prior or during cultivation. We can therefore change the network pattern of nerve cells in real time during cultivation by adding microchannels connecting different microchambers in a step-by-step fashion. This has helped us to understand the meaning of the spatial pattern of a neuronal network by comparing the changes in cell signaling before and after changing the network shape. However, until recently we were not able to control the direction of synaptic connections. We have developed a method to fully control the direction of neural networks within the agarose microchamber (AMCA) system. Our technique can be used to obtain long-term electronic properties of topographically controlled neuronal networks with precise fixation of cell positions and flexible network pattern rearrangement through photo-thermal etching of the agarose layer. This manuscript describes our method for controlling the direction of synaptic connections with the newly developed neural-cell cultivation chip. We have developed an individual-cell-based on-chip cell-cultivation system consisting of an agarose microchamber (AMCA) cell cultivation array maintained at constant temperature, controlled atmosphere and humidity (Figure 1). We used the AMCA cell cultivation chip to create a neural cell network from individually grown cells. The AMCA was fabricated on the surface of 0.5 mm thick glass slide coated with 50 nm thick indium-tin oxide (ITO). Prior to agarose coating, we have coated the ITO layer with collagen I and Poly-D-Lysine to improve cells' adhesion to the surface (Figures 2(a),2(b),2(c)). In order to spatially separate cells, define their positions, and the network pattern, a 10-μm-thick agarose layer on the AMCA chip surface was etched by spot heating using the infrared laser to form microchambers and microchannels (Figure 1). Wells and tunnels were formed within the agarose layer according to the trace of the heating spot of laser. To create a precise microchamber design, we checked the position of the heating spot with an optical microscope prior to irradiating the chip with 1064 nm laser beam. We also confirmed whether the irradiation time and intensity was sufficient for desired size and shape by direct microscopic observation, as described previously [6, 7]. Size and shape of the melted areas was controlled by manipulatingthe intensity of laser power and the magnification of objective lenses. 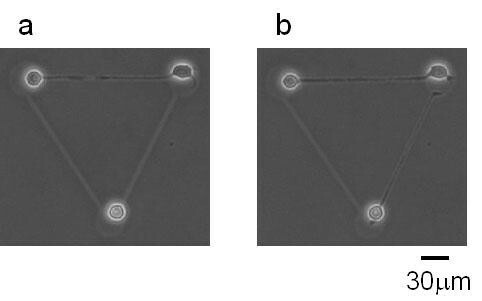 First, as shown in Figures 2(d),2(e) and 2(h),2(i), we irradiated 35-mW focused laser using ×10 objective lens to form a 30-μm-diameter round microchambers for cultivating cells. The size of the wells was monitored by optical microscope and the heating continued until the wells reached a desired size. Next, we etched the 5-μm-wide tunnels (microchannels) between two adjacent holes with 17-mW laser using X20 objective lens (Figures 2(f) and 2(j)). It should be noted that at this stage we have connected only one chamber with the tunnel. The tunnel width was limited to 5 μm in order to prevent cell bodies passing through the tunnels. Finally, we melted a portion of agarose layer at the end of the tunnel to connect two microchambers (Figures 2(g) and 2(k)). For this experiment, we used low-melting-point (LMP) agarose that melted at about 65°C. The use of LMP It is required in order to minimize the damage to cells within the microchambers when we change the shape of microstructures during cultivation. Another important requirement for the agarose is an absence of contaminations, since impurities such as dust particles absorb 1064-nm-wavelength laser light and may cause unpredicted and uncontrolled melting of the agarose. Schematic drawing of the on-chip agarose microchamber (AMCA) cell cultivation system. Photo-thermal etching procedures. (a)-(c), preparation of chip surface. (d)-(g) and (h)-(k), schematic drawings and micrographs illustrating the procedure of photo-thermal etching. Figure 3 shows the schematic drawing of hippocampal cell cultivation in AMCA chip. Prior to cultivation microchannels were connected only to one side of two adjacent microchambers. Then, individual cells were introduced into each AMC and cultivation was started as described in Figs 2(f) and 2(j). To control the number of cells and cell types in each chamber, we used a micropipette to introduce individual single cells into each chamber. After neurites were sufficiently elongated into each microchannel, the other sides of the channel were connected by photo-thermal etching (see Figs 2(g) and 2(k)) to allow elongated neurite to connect to cells in the neighbouring chamber. Figure 4 illustrates an example of such a procedure. The micrographs show phase-contrast images of the growth of single hippocampal cells in three microchambers. When the cultivation started, single cells were transfered to AMCAs (Fig. 4(a)). Six hours later, single neurites elongated from cells into microchannels (Fig. 4(b)). At that time additional photo-thermal etching was used to connect two adjacent AMCAs (Fig. 4(c)). Two hours later (8 h total cultivation time), all of the cells kept their shape and continued their elongation (Fig. 4(d)). Eventually these cells were connected by their neurites counter-clockwise. (Figs 4(e) and 4(f), 14 and 28 h cultivation, respectively). The use of the stepwise photo-thermal etching has ensured the unidirectional elongation of cells. If no stepwise photo-thermal etching is use (i.e. 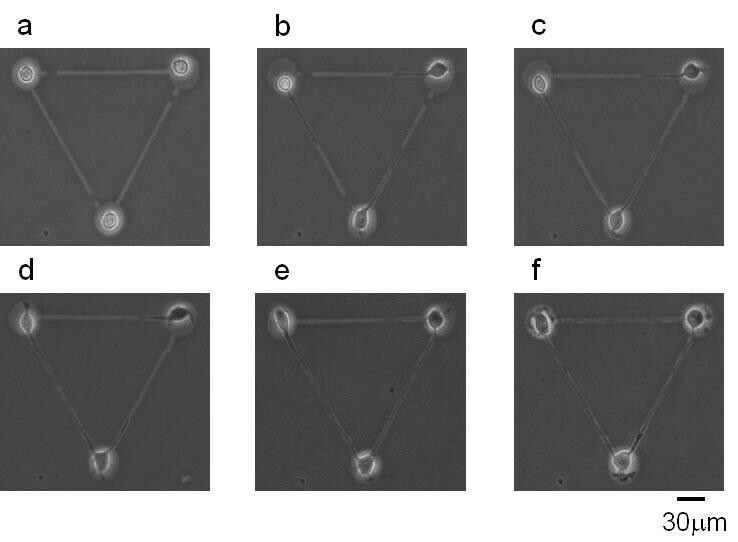 if each microchambers had two channels), cells in such microchambers elongated in both directions (clockwise and counter-clockwise) simultaneously as shown in Figure 5(a) (5 h after cultivation started). Schematic drawing of hipocampal cell cultivation in AMCA chip. Hippocampal cell cultivation for controlling the elongation direction of neurites with stepwise photo-thermal etching. (a)-(f): optical micrographs obtained after 0, 6, 8, 14, and 28 hours of cultivation started, respectively. (c): additional photo-thermal etching to connect two adjacent AMCAs. Hippocampal cell cultivation without stepwise photo-thermal etching. (a), (b): optical micrographs obtained after 5, 8 hours cultivation started, respectively. To evaluate the ability and limit of the stepwise photo-thermal etching method used during cultivation, we need to measure the extent of damage incurred on the collagen layer by localised heating. 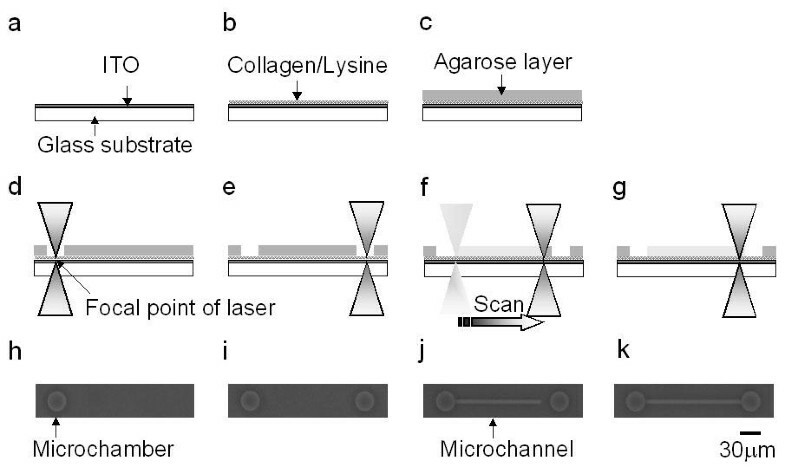 The collagen layer is essential for the stable attachment of neural cells onto the chip, but it is heated by the focused infrared laser during photo-thermal etching. We have therefore examined the effect of heating on the collagen layer using a collagen coated chip (Figures 6(a),6(b),6(c),6(d)). Figure 6(a) is the micrograph of the 20-hour-cultivation of hippocampal cells on the collagen layer. Figure 6(b) shows the cultivation of the same cells on the collagen layer, which was incubated for 60 min at 65°C before cultivation started. The incubation temperature, 65°C, was determined by the melting of LMP agarose (at 65°C). Figure 6(c) illustrates the cultivation of the same cells on the collagen layer, which was incubated for 60 min at 90°C before cultivation started. In this case the incubation temperature, 90°C, was determined by the possible highest temperature by spot heating of infrared beam, ca. 90°C. As a reference, we also cultivated the same cells on the chip without a collagen coating (Figure 6(d)). As shown in Figures 6(a) and 6(b), the difference in the cell growth on the pre-heated and not heated chips. Even when the chip was pre-heated 90°C for one hour, the growth of neuritis was nearly identical on all chips (pre-heated and non pre-heated). In this experiment chips were irradiated for one hour, in contrast to a regular experiment when no more than few seconds of irradiation is required to produce a channel. Thus the effect of photo-thermal etching on collagen layer was smaller than the result shown in Figures 6(b) and 6(c). If the collagen molecules were diffused, the result must be same as the result shown in Figure 6(d), where cells could not attach. (a)-(d): Optical micrographs of the 20-hour-cultivation of hippocampal cells on the collagen coated microchips. (a) without any additional treatment; (b) after 65°C, 1 h treatment; (c) after 90°C, 1 h treatment; (d) without collagen coat (as a reference). (e), (f): Optical micrographs of cultivated cells in AMCAs. 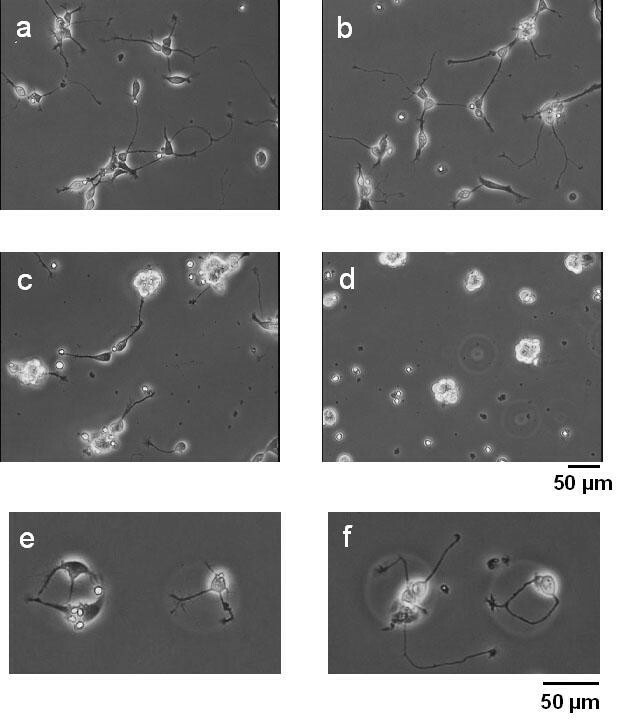 (e) cells cultivated in the photo-thermal etched microchambers without any additional treatment; (f) cultivated in the collagen re-coated microchambers after photo-thermal etching. We have also checked the suitability of a collagen layer for cell cultivation using an AMCA cultivation chip. In the AMCA chip, the collagen layer is between ITO layer and top agarose layer. To manufacture the cultivation wells, we used 1064-nm 35-mW focused laser for 2 s with ×10 objective lens to form 50-μm wide round microchambers. Figure 6(e) is the micrograph taken after 20-hour of cultivating hippocampal cells in these microchambers. Figure 6(f) is the micrograph of the hippocampal cells grown under the same conditions as Figure 6(e), except for the AMCA chip re-coated with collagen after photo-thermal etching. As seen on Figures 6(e) and 6(f) little or no difference was observed between cells grown in different chambers. However, the neuritis on the collagen re-coated chip climbed over the microchambers (Figure 6(f). These results indicate that the collagen layer between ITO layer and agarose layer kept their performance even after photo-thermal etching. As described above, we can fully control the direction of elongation of neurites by the stepwise photo-thermal etching method. This task is impossible for the conventional pattern control method like microprinting and microstructures. Because neuronal cells have the tendency to elongate one neurite, followed by multiples of short dendrites, the ability to control the elongation direction of the first allows to fully control the direction of neural network. We have therefore created only one tunnel for each AMCA well to guide each neurite into the tunnel in the desired direction. Only after the neurites have sufficiently grown into the tunnels, have we connected the tunnels to other AMCA wells. Our system uses a 1064-nm focused infrared laser beam, as in [6–9]. This wavelength is not absorbed by water, cells or agar. Only ITO layer is capable of absorbing this wavelength and therefore only a portion of the agar near the ITO layer is melted. This has ensured minimal damage to cultured cells. We have developed a novel method for controlling the direction of neurite elongation by the stepwise photo-thermal etching. Our on-chip AMCA cell cultivation system combined with a 1064-nm photo-thermal etching method makes it possible to easily and quickly form desired structures within agar layers. We demonstrated that that neural cells can be grown and neural network with the desired direction of neural connections can be created in the AMCA chip. Possible damage of the collagen layer inside the AMCA chip was also investigated to confirm that no distinguishable damage was observed for neural cells cultivation even after the photo-thermal etching procedure. Our system has potential for use in the biological/medical fields for cultivating individual-cell-based networks and measuring their properties. 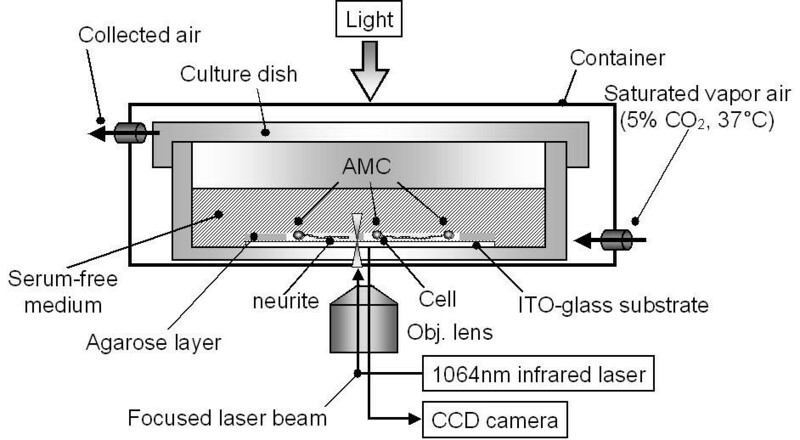 AMCA chips were kept at in a constant temperature and under controlled atmosphere and humidity (37°C, 5%, respectively) Aphase-contrast/fluorescent optical microscope (IX-70; with a phase-contrast objective lens, ×20, Olympus, Tokyo, Japan) with a focused 1064-nm infrared laser irradiation unit (max. 1 W; PYL-1-1064-M, IPG Photonics, Oxford, MA, USA) was used to melt the agar layer on the chip. The objective lens in the microscope was used to simultaneously observe the chip surface and to focus the 1064-nm laser. A series of phase-contrast images of cell growth and network formation was acquired by using a charge-coupled device (CCD) camera (CS230, Olympus) and recorded in the computer system with a video capture board. To attach the collagen onto the ITO surface, the chips were washed twice with 80% ethanol and with PBS, air dried and treated with 2 ml of 150-μg/ml collagen solution (pH 3.0) (Collagen type I-C (from pig skin): Nitta Gelatin, Tokyo, Japan). Following 24 h incubation at room temperature, the chip was washed with PBS once and incubated with 2 ml of a 100-μg/ml Poly-D-Lysine solution (Poly-D-Lysine: SIGMA) for 24 h at room temperature. Following the incubation, the chip was washed with PBS. Collagen and Poly-D-Lysine treated surfaces were coated with 2% (w/v) agarose (ISC BioExpress, GenePure LowMelt: melting temp. 65°C) using a spin-coater (500 rpm for 5 s followe by 4000 rpm for 20 s). The agar-coated chips were placed in a refrigerator at 4°C. The microstructures within the layer were designed using a photo-thermal etching procedure. Rat hippocampal cells were obtained from 18-day-old fetuses (E18) following a dissection protocol as described previously . The isolated tissue was incubated in 0.25% trypsin (Sigma) in Ca2+- and Mg2+-free Hank's balanced salt solution (HBSS, Gibco) for 8 min at 37°C. After trypsination the tissue was rinsed in a 2-ml plating medium (Neurobasal medium with B27 supplement, Gibco) five times for 5 min and mechanically dissociated with a fire-polished pipette into single cells. The cells were placed one by one into each agar microchamber with a micropipette and incubated at 37°C with 5% CO2 at saturated humidity (Figure 3). We used a conditioned serum-free medium (Neurobasal medium with 0.074 mg/ml L-glutamine, 50 μg/ml gentamycin, 2% (v/v) B-27 supplement 25 μg/ml, Gibco and 50 μg/ml L-glutamic acid hydrochloride, Sigma). Hippocampal glial cells were cultivated for 2 weeks. IS and YS carried out the microchamber design, cell preparation, single cell observation, image analysis. YJ carried out cell preparation and discussed this study. HM and IS carried out the microchamber design, cell preparation, single cell cultivation and observation, image analysis. They were equally contributed for this article. KY conceived of the study, and participated in its design and coordination. All authors read and approved the final manuscript.